His Excellency Most Reverend Timothy M. Dolan, Archbishop of New York, received the Knight Grand Cross of the Order of Saints Maurice and Lazarus on December 11, 2011, an international honor conferred by His Royal Highness Prince Victor Emmanuel of Savoy, son of the late King Umberto II of Italy and Head of the Royal House of Savoy. The honor was in recognition of the Archbishop’s exemplary leadership as head of his large Catholic archdiocesan flock and as an important church and religious leader in America. The representative of the Prince and the leadership of the American Delegation of Savoy Orders participated in the presentation ceremony. H.E. Archbishop Timothy M. Dolan of New York receiving the Knight Grand Cross of the Order of Saints Maurice and Lazarus from the representative of HRH Prince Victor Emmanuel of Savoy, Dr. Sergio Pellecchi, December 11, 2011 with the Delegate and Vice Delegates of the American Delegation of Savoy Orders at the Archbishop’s residence. Prince Victor Emmanuel’s American Delegate, Carl J. Morelli, stated: “The American Delegation of Savoy Orders is privileged and honored to have such a distinguished prelate of the Church a member of our confraternity of knights and dames. 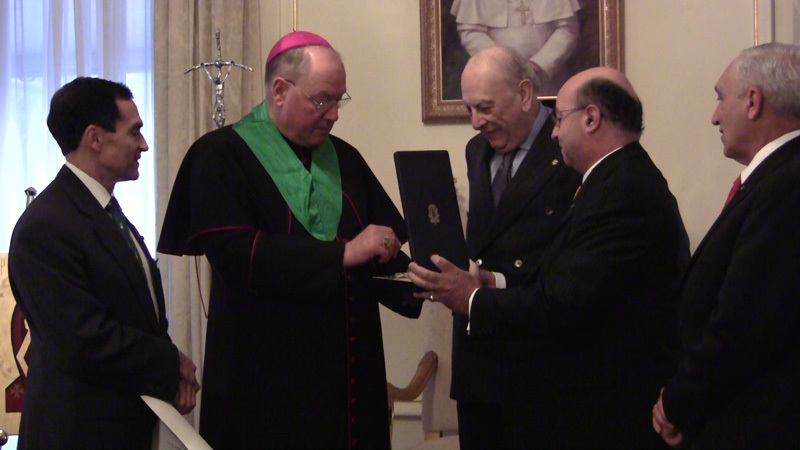 The Most Reverend Timothy M. Dolan, the Archbishop of New York, was honored by His Royal Highness Prince Victor Emmanuel of Savoy, who conferred on the Archbishop the highest honor of a Knighthood, the insignia of the Order of Saints Maurice and Lazarus, on December 11, 2011. Prince Victor Emmanuel of Savoy is the son of the late King Umberto II of Italy. Archbishop Dolan has members of his archdiocese who are highly involved with the activities of the Savoy Orders, ancient orders of knighthood which date back to the Crusades, and have traditionally been devoted to charitable works. Following the investiture presentation, the Knights and Dames of the Savoy Orders led the procession for the Sunday morning High Mass with Archbishop Dolan, who welcomed them to the Mass. The American Delegation through its charitable arm, the American Foundation of Savoy Orders, contributes to humanitarian, hospitaller and charitable projects and initiatives across North America and abroad, particularly in healthcare and hospice care, disaster relief, education programs and children’s causes. Recent contributions have gone to Casita Maria, St. Jude’s Research Hospital, the New York Foundling Hospital, the Near East Catholic Welfare Association, the Latin Patriarchate’s University of Madaba Scholarships and the establishment of the Savoy Orders Pigott Scholarships in the humanities and international studies. Recognition as a Knight Grand Cross of the Order of Saints Maurice and Lazarus (OSSML), an international honor, was presented to the Archbishop by the Prince’s representative, Knight Grand Cross Dr. Sergio Pellecchi, in view of the Archbishop’s exemplary leadership as head of his large archdiocesan flock, and as an important Church leader in America. He follows in the footsteps of other prelates of the Church who received the same honor from the Prince, such as Cardinals Bevilacqua of Philadelphia, McCarrick of Washington and Egan of New York. 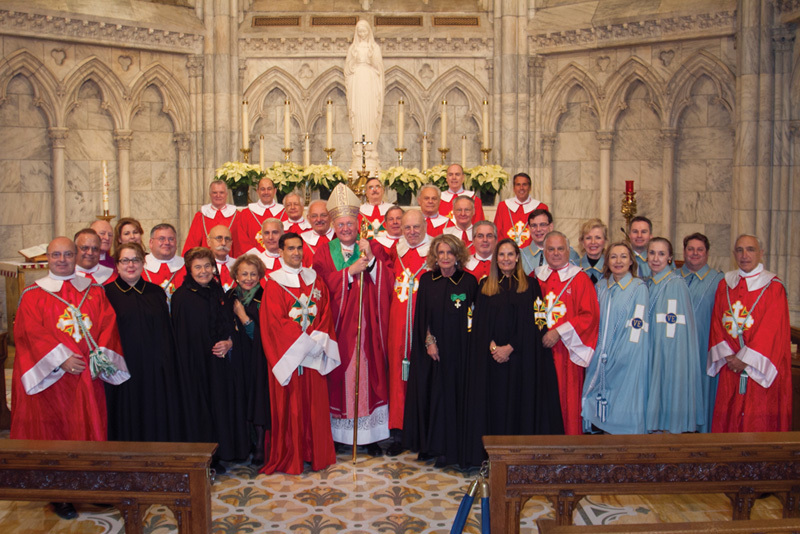 Archbishop John J. Myers of the Archdiocese of Newark received the honor last year during the Prince’s visit to New York City for the 2010 Ballo di Savoia. For further information concerning the Savoy Orders, contact Larissa Van Duser at 212.972.1100, ext. 245 or delegate(at)savoy(dot)org. 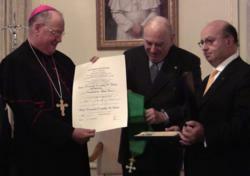 Archbishop Timothy Dolan of New York Honored with Savoy Orders KnighthoodH.E. 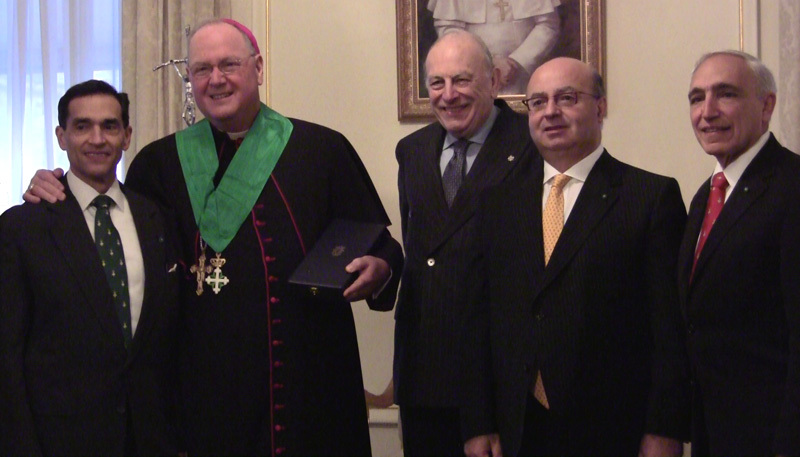 Archbishop Timothy M. Dolan of New York receiving the Knight Grand Cross of the Order of Saints Maurice and Lazarus from the representative of HRH Prince Victor Emmanuel of Savoy, Dr. Sergio Pellecchi, December 11, 2011. 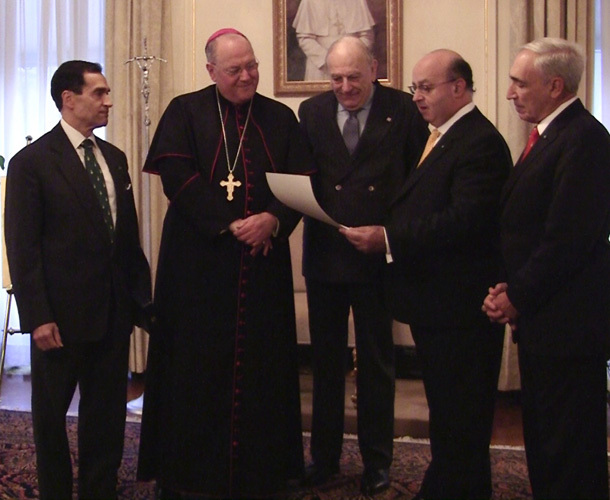 Archbishop Dolan Receives Insignia of the Savoy Orders(l to r) Delegate Carl J. Morelli, Archbishop Timothy Dolan, Dr. Sergio Pellecchi, Coordinator of the Savoy Orders in the Americas and Vice Delegates Pasquale Menna and Joseph Sciame at the presentation ceremony, December 11, 2011. Archbishop Dolan Receives a Knight Grand Cross of OSSML(l to r) Delegate Carl J. Morelli, Archbishop Timothy Dolan, Dr. Sergio Pellecchi, Coordinator of the Savoy Orders in the Americas and Vice Delegates Pasquale Menna and Joseph Sciame at the presentation ceremony, December 11, 2011. Members of the American Delegation of Savoy Orders with H.E. Archbishop Timothy M. DolanKnight Grand Cross of the Order of Saints Maurice and Lazarus, Archbishop Timothy M. Dolan (center) greets the members of the American Delegation of Savoy Orders following the Solemn Mass at the Cathedral of Saint Patrick on December 11, 2011.